time for more Genealogy Fun!! 1) Geneablogger Alona Tester has devised a new meme called the "When I Was Young" genea-meme on her blog, LoneTester HQ. 2) Since the genea-meme is 25 questions, let's do them five at a time. This week, answer questions 1 to 5. 3) Share your answers on your own blog post, in a comment on this blog post, or in a Facebook post or a Google+ post. I have not found any memorabilia, except for lots of photographs, from my years as a baby. My grandfather took most of the photos in the first two years of my life since my mother was working and my father was in the U.S. Navy. 2) Do you know if you were named after anyone? My understanding is that they debated between "Randy" and "Ranny" and "Randy" (actually "Randall" was selected. Ranslow Smith was my third great-grandfather and my great-grandmother probably lobbied for "Ranny." I have no clue where my middle name, "Jeffrey" came from. 3) And do you know of any other names your parents might have named you? 4) What is your earliest memory? My earliest vivid memory is of my baby brother coming home from the hospital in September 1946. We lived at 2114 Fern Street and I recall seeing my mother hold the door and my father enter holding baby Stan. My live changed! 5) Did your parent/s (or older siblings) read, sing or tell stories to you? Do you remember any of these? I am sure that my mother, grandmother and grandfather read books to me from an early age. The Carringers were a literate family with a bookcase of educational books. The Seavers not so much. I know that my grandmother sang to me and my brothers all while we were growing up, especially at Christmas time. That was special. The only ones I recall are the popular Christmas carols. I am in the 8th great-grandmothers and I'm up to Ancestor #1103 who is Mehitabel CHENEY (1643-1693) [Note: the earlier great-grandmothers and 8th great-grandfathers have been covered in earlier posts]. 1102. Thomas Wight, born about 1629 in England; died 25 September 1690 in Medfield, Norfolk, Massachusetts, United States. He was the son of 2204. Thomas Wight and 2205. Alice. He married about 1661 in probably Roxbury, Suffolk, Massachusetts, United States. 1103. Mehitabel Cheney, born 01 June 1643 in Roxbury, Suffolk, Massachusetts, United States; died 1693 in Medfield, Norfolk, Massachusetts, United States. * Mary Wight (1667-1705), married 1686 Joseph Clark (1664-1731). Eleazer Wight (1670-1747), married 1694 Relief Warren (????-1740). * Joshua Wight (1679-1762), married (1) 1696 Abigail Rockwood (1679-1696); (2) 1699 Elizabeth Spowell (1683-1765). 2206. William Cheney, born before 05 February 1599 in Barrington, Cambridgeshire, England; died 30 June 1667 in Roxbury, Suffolk, Massachusetts, United States. He was the son of 4412. John Cheney and 4413. Elizabeth. He married about 1623 in England. 2207. Margaret, born about 1603 in England; died 03 July 1686 in Roxbury, Suffolk, Massachusetts, United States. * Ellen Cheney (1626-1678), married 1643 Humphrey Johnson (1620-1693). * Margaret Cheney (1628-1685), married 1651 Thomas Hastings (1605-1685). * Thomas Cheney (1633-1693), married 1656 Jane Atkinson (1635-1724). * William Cheney (1637-1681), married 1661 Deborah Wiswall (1641-1681). * Joseph Cheney (1647-1704), married (1) 1668 Hannah Thurston (1650-1690); (2) 1691 Mehitable Plimpton (1655-1725). * Joan S. Guilford , The Ancestry of Dr. J.P. Guilford (Sheridan Psychological Services, Inc., 1990), Volume 1. * Dean Crawford Smith, edited by Melinde Lutz Sanborn, The Ancestry of Eva Belle Kempton, 1878-1908, Part I: The Ancestry of Warren Francis Kempton (1817-1879) (Boston, Mass. : New England Historic Genealogical Society, 1996). Dear Randy: How Would You Search for Obituaries Efficiently? 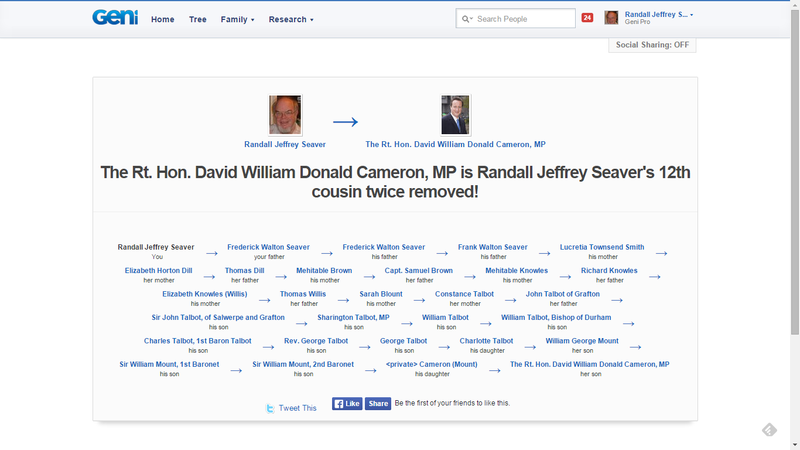 "Over the years I’ve located almost 1,000 obituaries for people in my family tree. They are invaluable for the obvious vital data plus the family relationships they outline. "I still have almost 600 U.S. obituaries to look for and would love your opinion on the most time efficient to look for such a large number. My time frame is 1880’s forward with most being in the 1900's. Ideally I would love to down load my GEDCOM to a genealogy site and let them tell me the matches. Ancestry.com is weak in the obituary department. I have explored the ‘few' obituary matches already. Few as a percentage of the total number of 3,000 people in my tree. "Any thoughts on a time efficient way to do this or clues on how you’d proceed when I exhaust the efficient ideas." After pondering the question for an hour or so, the simple answer seems to be "No - there are no time efficient ways to do this easily for a number of ancestors." The only database that provides Record Hints for newspaper articles is MyHeritage. Ancestry.com does not do this for their newspaper collection - you have to manually search like other sites. 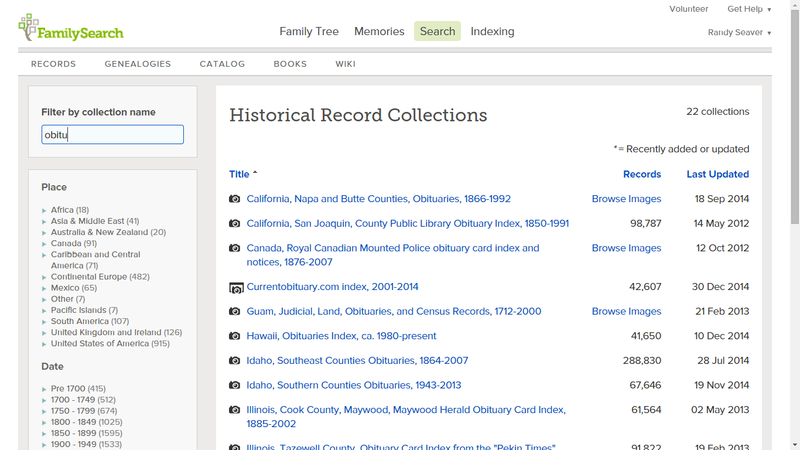 FamilySearch has millions of indexed obituaries, with many more coming online soon, but you would have to search them one target, and probably one record collection, at a time. * I would organize the obituaries I want to find by surname - perhaps list the targets in a spreadsheet or a word processing table - alphabetically by surname, then first name, with birth and death dates, and death location. * I would add columns for major online newspaper databases (e.g., Ancestry, MyHeritage, FamilySearch, GenealogyBank, Newspapers.com, Chronicling America, Elephind, Legacy, Tributes, Google, others) and check them off as you search. I have a set of online Historical Newspaper links on http://www.geneamusings.com/p/randys-genealogy-links.html. * The low hanging fruit are probably those that died as adults with a specific death date and location. The specific date enables me to narrow your search (I would use plus or minus two years in case the death date is wrong). * Searching for specific first and last names, with a place name and a death date range, is probably the most time efficient method in each database set. Using just the last name will find too many matches in many databases. Adding keywords to search on children's and spouses first names could narrow the search for common names. I love Mary Beth's vision - upload a GEDCOM file to a website, and tell it to search selected websites for matches to persons in your GEDCOM while you go about your daily activities. Do my readers have ideas for Mary Beth? Please make a comment if you have a time efficient idea. One of my ongoing projects is to "mine" the Ancestry.com Hints (the "green leafs") by record collection rather than by person. I've completed the Social Security Death Index, 1940 U.S. Census and 1930 U.S. Census, and I'm working on the 1920 U.S. Census Hints (only 840 to go!). Sometimes I get curious about a record collection, and that was the case today. I saw Marian Pierre-Louis' blog post (Putting a Face On Your Ancestors) about the U.S. Passport Applications, 1795-1925 database on Ancestry.com. I immediately thought "gee, I wonder if I have any Hints for that collection?" I figured out the database number (it's dbid=1174) and quickly used my scheme in Tuesday's Tip - Search Ancestry.com Hints by Record Collection to find that I have 23 Hints from this database for persons in my Ancestry Member Tree (there are probably more because Ancestry hasn't given me Hints for about 80% of my AMT). 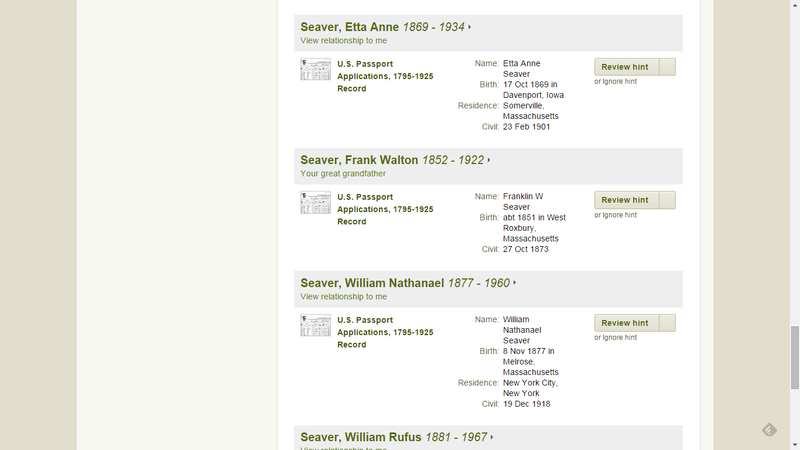 Look at that, my great-grandfather Frank Walton Seaver (1852-1922) applied for a passport. I didn't know that. I was excited, and couldn't wait to see what new revelations there might be for him. 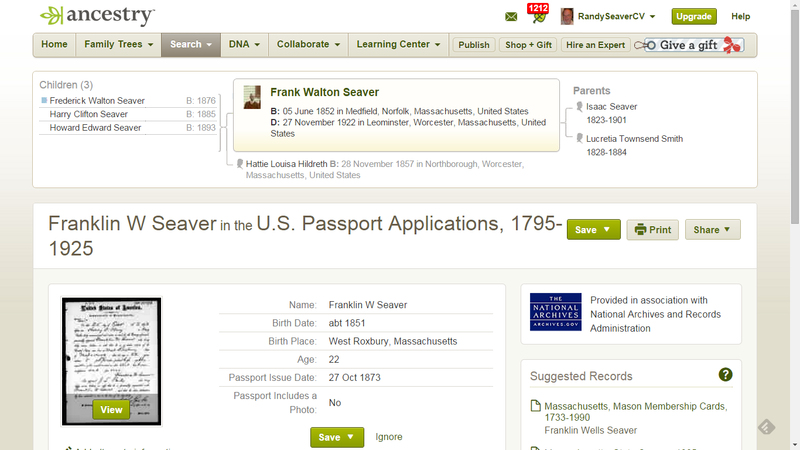 But wait, the record is for Franklin W. Seaver born in about 1851, and born in West Roxbury, not Westminster. If this was my ancestor's record, I would save the record image (after checking for another page or two) to my computer, attach it to the Media for the ancestor, create an Event, craft a source citation, transcribe the record and put it in the Event Note, and tag the Media item to the Event. I'd also write a Treasure Chest Thursday post about it. There are only 23 Hints for this database at present - that's about one hour's worth of adding content and sources to the RootsMagic database, well worth doing. I'll then add the database to my list of databases that I've "mined." At some point in time, I will go through that list and see if there are more Hints that were added since my "mining" was done. I think that the other 22 Hints from this database are for the right persons. My experience is that Ancestry Hints are 80-90% accurate because of relatively common names and the nature of the Hint search. My wish is that Ancestry.com would put a button on each specific database (like the U.S. Passport Applications) that says "See who in your Ancestry Member Tree is in this database." That would be really helpful! It's not hard to do if I can do it using two numbers in a URL. Elizabeth Keyes (1759-1793) is #73 on my Ahnentafel list, my 4th great-grandmother. She married in 1777 to #72 Zachariah Hildreth (1754- ca 1820). * their son #36 Zachariah Hildreth (1783-1857), who married # 37 Hannah Sawtell (1789-1857) in 1810. * their son, #18 Edward Hildreth (1831-1899), who married #19 Sophia Newton (1834-1923) in 1852. * their daughter #9 Hattie Louise Hildreth (1847-1920), who married #8 Frank Walton Seaver (1852-1922) in 1874. * their son, #4 Frederick Walton Seaver (1876-1942), who married #5 Alma Bessie Richmond (1882-1962) in 1900. * their son, #2 Frederick Walton Seaver (1911-1983), who married #3 Betty Virginia Carringer (1919-2002) in 1942. "Keyes Elizabeth Keyes Daughter of Jonathan Keyes and Elisabeth his wife was born April the 8 1759"
"Sept 1  Zachariah Hildreth with Elizabeth Keys both of Westford." "[HILDRETH] Zachariah [jr. int. ], and elizabeth Keyes, at Townsend, Sept. 1, 1777*"
Only five of her nine children lived to adulthood and marry. And sleep with me among the dead."
. 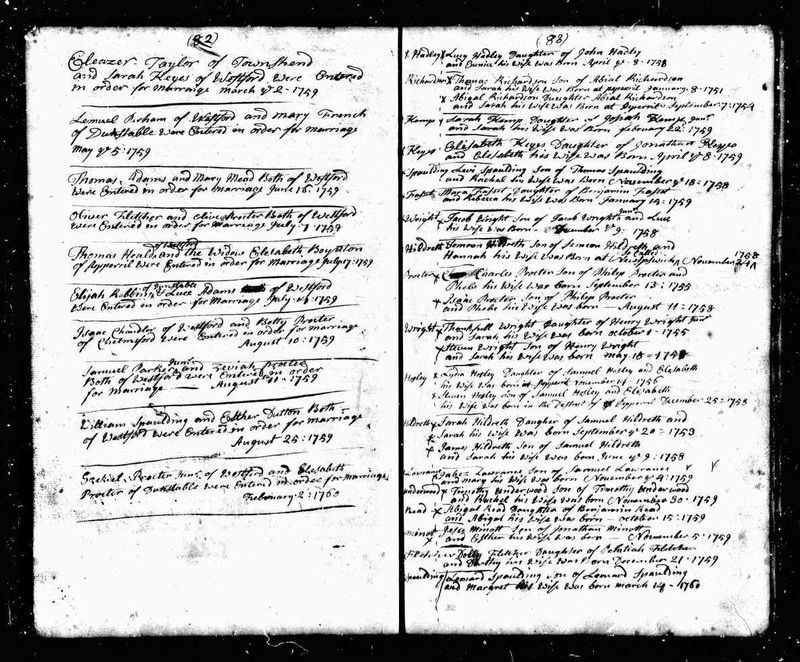 Massachusetts, Town and Vital Records, 1620-1988, digital images, Ancestry.com (http://www.ancestry.com), "Westford, Births, Marriages and Deaths," page 83 (penned, image 48 of 1750), Elizabeth Keyes birth entry.
. Vital Records of Westford, Massachusetts to the Year 1849 (Salem, Mass. : The Essex Institute, 1915), Births, page 65, Elizabeth Keyes entry.
. Massachusetts, Town Records, 1620-1988, digital images, Ancestry.com, "Townsend Births, Marriages, and Deaths," page 338 (image 793 of 1351): Zachariah Hildreth and Elisabeth Keys entry.
. Vital Records of Westford, Massachusetts to the Year 1849, Marriages, page 194, Zachariah Hildreth and Elizabeth Keys entry.
. Henry C. Hallowell (editor), Vital Records of Townsend, Massachusetts (Boston, Mass. : New England Historic Genealogical Society, 1992), Marriages, Book 1, page 23, Zachariah Hildreth and Elisabeth Keys entry.
. Westford, Massachusetts, Certificate of Marriage, Zachariah Hildreth to Elizabeth Keyes, 1 September 1777; Town Clerk's Office, Westford, Mass. (certificate dated 12 January 1995).
. Massachusetts, Town Records, 1620-1988, digital images, Ancestry.com, "Townsend Births, Marriages and Deaths, Book 6" page 98 (penned, image 163 of 1351), List of children of Zachariah Hildreth, 1778-1808.
. Henry C. Hallowell (editor), Vital Records of Townsend, Massachusetts, Records of the Old Cemetery, page 344, Elisabeth Hildreth entry.
. Jim Tipton, indexed database, Find A Grave (http://www.findagrave.com), Old Burying Ground, Townsend, Mass., Elisabeth Keyes Fletcher memorial #113322764. AncestryDNA announced the launch of "revolutionary new technology" that powers "New Ancestor Discoveries" today - see the press release here, and the example images here. There is an "Introducing Ancestry's "New Ancestor Discoveries" at https://www.youtube.com/watch?v=VF1niJhBgiw. 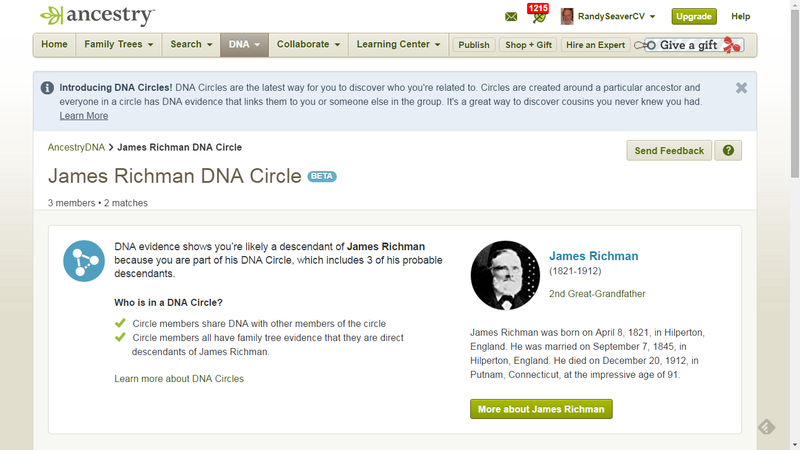 There are several new features in this launch - the DNA Circles graphic which shows graphically who shares common DNA with others in the DNA Circle, and the link to a combined LifeStory of the common ancestor (if I am an Ancestry subscriber). "It is effectively a shortcut through time -- you take the test today and we tell you who your ancestors were, for example, in the 1700s. You don't need to research records or build a family tree -- AncestryDNA now transports you to the past," said Dr. Ken Chahine, SVP and GM of AncestryDNA. "It's a combination of three things that allowed us to achieve this breakthrough innovation: 1) millions of family trees created by Ancestry members, 2) the fastest growing genetic database in the world, currently with more than 800,000 genotyped members and 3) a dedicated team of scientists who are pushing the boundaries of genetics and statistics to help people make family history discoveries in ways never before possible." Lookee there - "You don't even need to research records or build a family tree..." Just take the test, and they'll tell you who you are related to. Cool. But...they're probably a long way away from being able to tell me who ALL of my ancestors are. Rather than just publish the press notice and nod my head and agree it's cool, I decided to look at my own results. 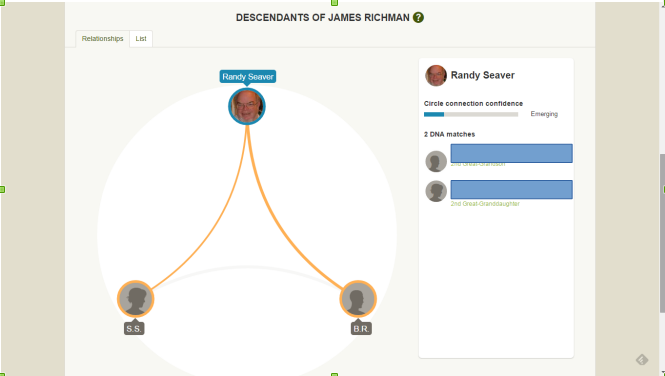 Unfortunately, I had no "New Ancestor Discoveries" when I checked my AncestryDNA page today. The graphic above shows that I share specific DNA segments with two other persons in the DNA database (note I have hidden the administrator's names). 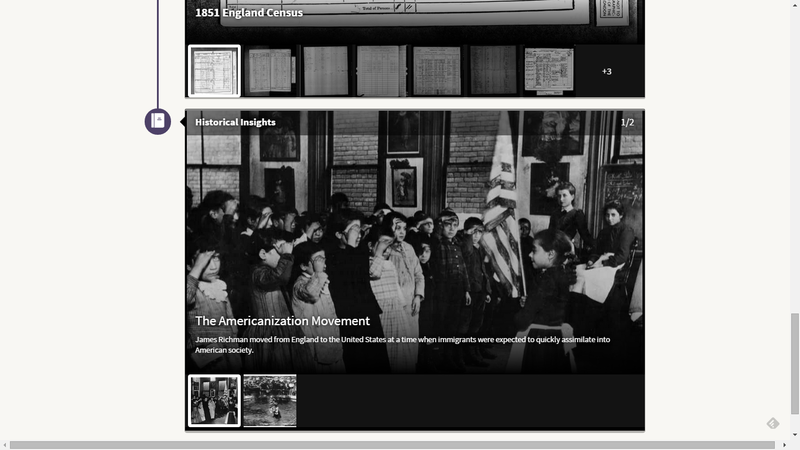 For the gallery, records and insights, there is a film strip below the image to see more of each collection. * I would be more excited if I had more DNA Circles - right now, I have only two, and they are husband and wife. I have corresponded with the two cousins in the DNA Circle so I have no real revelations at this time. Even with my rich New England ancestry, I have only two, and they were born in England. * I would be more excited if there was a DNA Circle for a person I don't have in my database - if it had found an unknown ancestor, especially in my Knapp, Newton or Lanphear surnames! I keep hoping! Maybe I'll be excited next year, or in five years, who knows! * Will AncestryDNA ever be able to tell me, just based on DNA, who all of my ancestors are, at least back 6 or 7 generations, as implied by Ken Chahine's statement? I think that it has a long way to go. It probably needs 10 to 20 million AncestryDNA test results. Ken's statement is another "You don't even have to know what you're looking for" advertising message, which I don't particularly like. 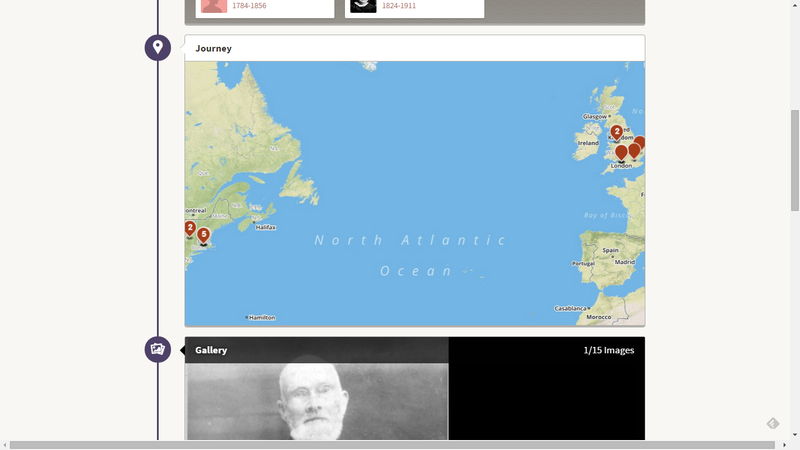 * The LifeStory feature will be coming to all users in a month or two, it's still in beta testing. I have used it as a beta tester. 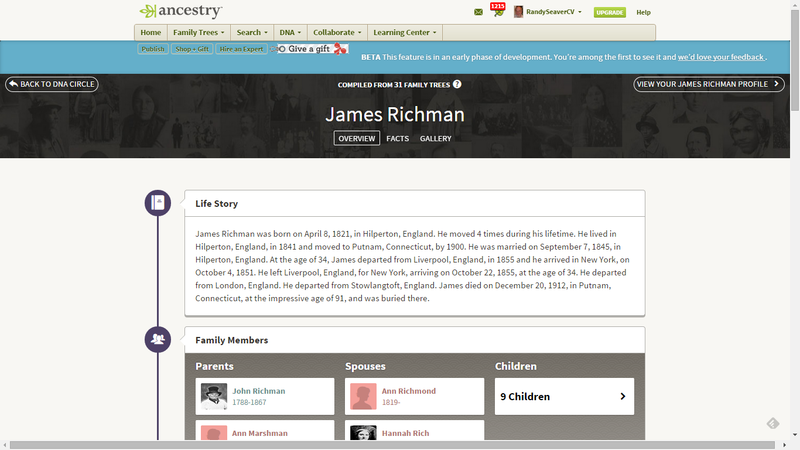 "James Richman was born on April 8, 1821, in Hilperton, England. He moved 4 times during his lifetime. He lived in Hilperton, England, in 1841 and moved to Putnam, Connecticut, by 1900. He was married on September 7, 1845, in Hilperton, England. At the age of 34, James departed from Liverpool, England, in 1855 and he arrived in New York, on October 4, 1851. He left Liverpool, England, for New York, arriving on October 22, 1855, at the age of 34. He departed from London, England. He departed from Stowlangtoft, England. 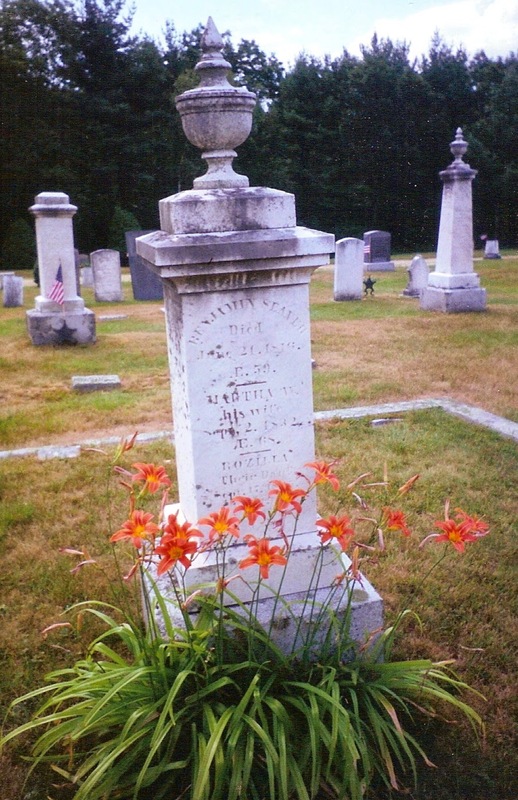 James died on December 20, 1912, in Putnam, Connecticut, at the impressive age of 91, and was buried there." Note that he "departed from Liverpool, England in 1855, and arrived in New York on October 4, 1851." There are also two other departure "facts" and another arrival fact. These discrepancies occur because Ancestry has combined information from 11 different Ancestry Member Trees in order to create this combined profile. In addition, there is a duplicate wife (Hannah/Ann) and a duplicate child (Emma), which are from the eleven separate profiles. 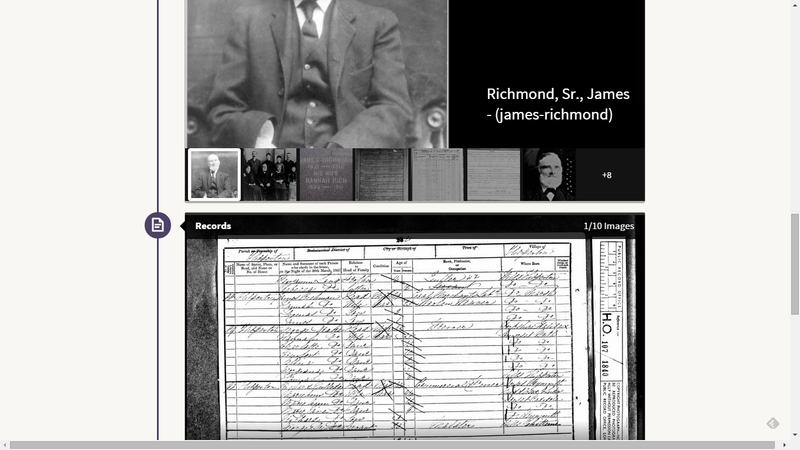 There are also duplicate record images (because some were uploaded and some were attached from Ancestry), plus a spurious 1881 English census record that doesn't include James Richman, apparently attached in error by one of the 11 tree owners. Unfortunately, the short biography cannot be edited because it is derived from eleven different profiles. I can edit the LifeStory elements when I'm in my Ancestry Member Tree, and those changes should be incorporated into this combined LifeStory. However, if the other profiles that contribute to the LifeStory don't edit their profile, the discrepancies will remain in the combined profile. I wrote FamilySearch is Adding IGI Extracted Source Data to Family Tree Profiles on 30 March 2015, and asked some questions at the end of the post because I was confused by what the website told me about the issue. 1) Why were they [the IGI sources] added, but, more importantly, what should I do with them! The new.familysearch (nFS) persons were created when FamilySearch put the AF, PRF, Indexed and Contributed IGI and other things all into one big merge process. At that time a mapping was created and maintained as to which indexed IGI personas were used to create which tree persons. That mapping was also maintained as nFS was shut down and transitioned to Family Tree. In as much as all the data on an indexed IGI persona comes from a single indexed document - these are no different from any other indexed historical document (there is nothing “conclusionary” or opinion’ish about them). In fact all of the indexed IGI personas are found today in the Historical Records database organized into their pertaining collections by location, record type and date. Since the release of Hinting, we are seeing users attach over a quarter million records personas to people in the Family Tree each day. Approximately 450 million of the 5.2 billion Historical Records personas hosted on Family Search are part of the indexed IGI. If one assumes it takes a user 5 minutes to find and attach one of these historical record personas to the corresponding person in the Family Tree, that represents ~4280 years of user time. That is user effort to recreate connections between the historical records personas and tree persona that we already have in our mapping. To save users time and to help users understand how the Family Tree persons were created, we are attaching the indexed IGI personas. NOTE: We are not attaching the contributed IGI persons. What should you do with them? Evaluate whether the persona in the record is the same as the person in the Family Tree. If it is not (if it was badly merged), you should identify what data on the Family Tree person might have come from that persona and correct the data on the tree person. You can detach that record persona and add a reason statement as to why it is not the correct person. 2) How does FamilySearch know that profiles were wrongly merged? We don’t know with any certainty when a Family Tree person was created out of sources representing different real historical people. We do know that the merge algorithms sometimes made mistakes. 3) How can I judge that the profiles were correctly merged? Users will be alerted that FamilySearch attached the sources from which the tree person was originally created through two means. First they will be informed of these attachments in the weekly “Changes” email for the people they are watching. Second they will see a yellow note when they click on an attached source that this source was used to automatically create the tree person. To determine if the persona in the historical document really is the same real historical person represented by the person in Family Tree the user will use standard genealogical proof standard analysis and comparison with all other sources, event and relationship data. 4) Who is responsible for separating improperly merged persons? 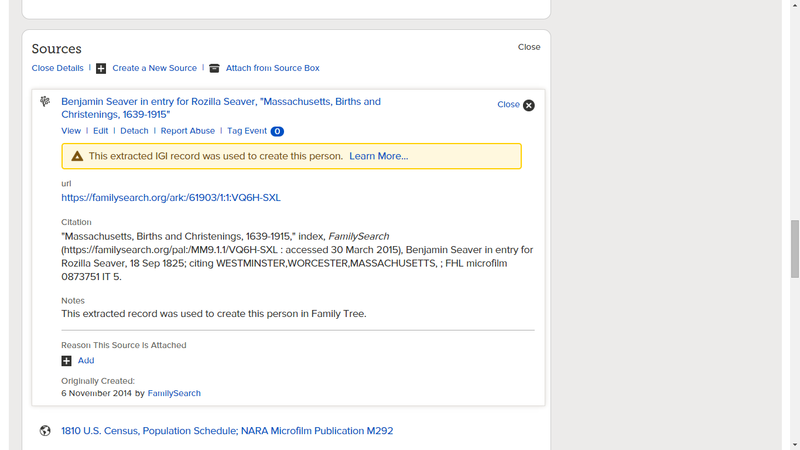 FamilySearch can make it clear to the user what actually happened in the process of tree person creation by attaching the related sources. Using those sources, researchers will need to identify those, hopefully rare instances, where there were flaws in the creation process and sources were badly merged. Yes the contributed IGI records are simply historical records that we happened to know where they should be attached to. There is nothing terribly unique about them than makes them different from a census record or military immigration record except that they were used to automatically create people int he tree at one time. If we’ve attached one of these, most of the time you should just consider yourself lucky that we just added a source document to your ancestor without you having to search for it and use the attach to to add it. 6) Were the IGI Hints attached to correct person profiles also? That would make sense - not every profile was merged incorrectly and many were not merged at all, i'm thinking. They are ALWAYS attached to the person that was created from them. Sometimes in the merge process multiple records were brought together that didn’t actually represent the same unique historical real person (just like a user might erroneously do today when they attach a record person to the wrong tree person). This should be rare, but can happen. 7) If an IGI persona was attached incorrectly, do you expect us to find the correct person profile to attach it to? What happens to IGI personas that get detached and not attached to another profile? If the record persona that was part of the merge does not represent the tree person it is attached to (and was used to create) you should take the same steps that you do whenever you find that one of the sources you have gathered doesn’t pertain to the person you are researching. First, make sure that the data from the erroneous record is not included in any of your conclusions - IOW correct any data on the tree person that may have come from the erroneous source. Second, remove the source from the set of sources that your are correlating and forming conclusions from - IOW detach it from the tree person and make the appropriate notes as to why you are making the “negative conclusion” that it is not really your ancestor. Once it is detached from your ancestor it may get attached to another person in family tree. That is fine. It may not be a source for your guy, but the record persona does represent someone who really lived and another user might conclude that it represents their ancestor and use it to document their ancestor’s life. 8) Can we detach IGI personas from IOUS people? I would guess so...since they are attached to only one profile. I really appreciate Robert's responses to my sometimes obtuse questions and will try to work with the IGI Sources as he recommends. You know, we always think that a software program or an online tree is, or should be, "finished" and "perfect." But usually that's not the case, is it? FamilySearch Family tree has been in development for several years now, and open to the public for over two years, and is still being developed. The progress has been steady and inspirational. My opinion has always been that this "one tree" concept has the potential to be the very best online tree system when completed. But it's not done yet, and it may take several years to work out the problems in the IOUS profiles. NOTE: There are several comments about the IGI sources attached at the end of my earlier post that illustrate some of the problems that other researchers have faced. 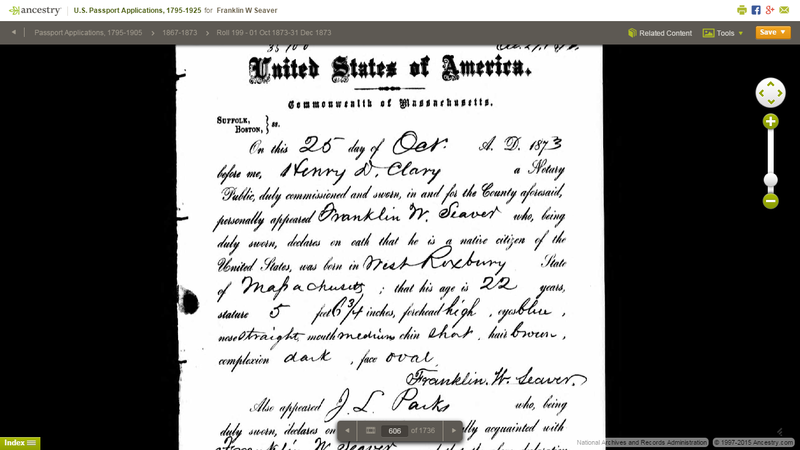 Treasure Chest Thursday - Post 256: 1759 Birth Record of Elizabeth Keyes in Westford, Mass. It's Treasure Chest Thursday - time to look in my digital image files to see what treasures I can find for my family history and genealogy musings. and Elisabeth his wife was born April the 8 1759"
Massachusetts, Town and Vital Records, 1620-1988, digital images, Ancestry.com (http://www.ancestry.com : accessed 7 December 2012), "Westford, Births, Marriages and Deaths," page 83 (penned, image 48 of 1750), Elizabeth Keyes birth entry. This appears to be an Original Source document of Westford town records with Primary Information that provides Direct Evidence of the births, marriages and deaths in the 18th century. Elizabeth Keyes (1759-1793) is my 4th great-grandmother, daughter of Jonathan and Elizabeth (Fletcher) Keyes, and was married to Zachariah Hildreth (1754-1820). She had nine children, but only five of them reached adulthood. So I wondered, why not me? Am I related to them too? After all, even if I'm related to one of them, that doesn't mean that I'm related to both of them. Our common ancestor is Sir John Talbot of Grafton (1485-1549). My line goes back through Seaver to Smith to Dill to Brown to Knowles all in Massachusetts, then in England through Willis to Talbot. Cousin David's line goes back through Mount to 9 generations of Talbots. My line goes through my Seaver to Gates to Hubbard to Rice, all in Massachusetts. cousin Kim's line goes back from her Jenner to Houghton to Mantor to Taylor to White to Sawyer to Rice, all in the USA. Unfortunately, I guess I didn't get Kim's beauty gene - it may have been from the Kardashian side of her family. 3) I doubt that cousin David or cousin Kim really care about this, but if they are interested in visiting their distant cousin in the San Diego area, the door is always open. 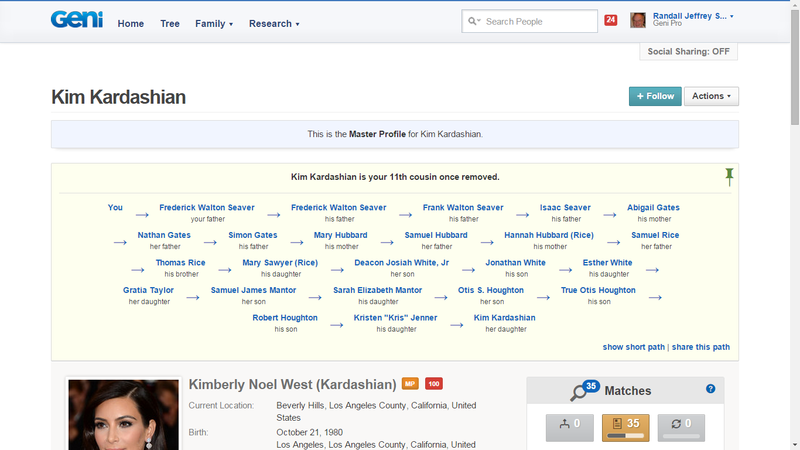 It may be that my daughters and grandchildren will be really interested in being Kim's cousin, so this may be useful in interesting them about their family history. I keep trying!! I can hardly wait for the next MyHeritage or Geni blog post about famous person relationships. So far, I've found I'm related to most of them! All but A.J. Jacobs, at least in recorded history.